Is European Football the New Boxing? I remember back in the day when Lennox Lewis faced Evander Holyfield for the heavyweight title. The fight became an example of a flawed sport plagued by match fixing when Lewis pummelled the current champ for twelve straight rounds and was awarded a draw by the biased judges. One judge even claimed Holyfield had somehow won the fight despite most boxing fans sitting at home realizing that the fight wasn’t even that close. Still to this day I have only bought one or two boxing matches on Pay Per View since that controversy. And I was wondering if the same thing will ever happen to European football? To be honest it already kind of has happened to Italian Serie A football. Juventus was spanked on the bottom for one year as they were caught in a scandal right before the World Cup. But a year later it was no harm no foul and the powerhouse squad was competing once again for Cups and titles and everything else. UEFA, through an international investigation into European football, alerted the RFEF of the existence of infractions committed by sportsmen who had betted on the outcome of matches they were playing in, and others. Two weeks ago, German police made headlines while they began arresting gang members that may be responsible for fixing matches in nine European leagues. 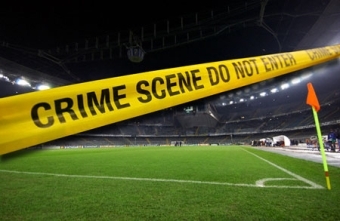 Police in Germany, Britain, Austria and Switzerland staged simultaneous raids arresting anyone involved in the match fixing scandal. The gang is being accused of paying off players and referees in order to fix the matches and it is believed that the gang profited somewhere around 15 million dollars by doing the illegal act. Only time will tell if any huge stars were on that match fixing list, but it seems like another blemish has been spotted on what was at one time a flawless sport.